Artists Michele Kong and David Seiler both find unique ways to transform everyday, ordinary spaces into extraordinary, meaningful places. They sharetheir insights into their intriguing creative processes during the Bemis Center’s first monthly ArtTalk: Resident Artist Lecture Series of 2005 on Thursday, February 3, at 7:00 p.m. As always, this event is free and open to the public. 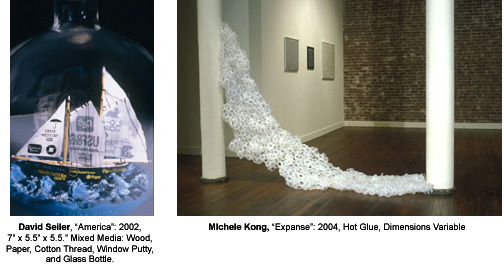 Michele Kong and David Seiler employ markedly different methods, but they both infuse a unique sculptural energy into their work. Escape the cold chill of winter by joining us at the Bemis Center for Contemporary Arts for the first Thursday in February and learn about how these artists explore places and shape spaces.